Primoxyl 100 is a soft steroid, anabolic action with minimal androgenic, the active substance is Methenolone Enanthate. According to the effects on the athlete, Primoxyl 100 can be compared with Oxandroxyl or Boldaxyl, all these 3 drugs are practically harmless to the body, are quite expensive and significant certainly weight gain from them you shouldn’t expect. Primoxyl 100 anabolic effects – 88% of testosterone. 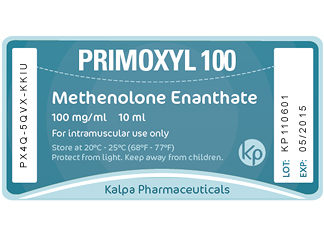 Primoxyl 100 derivative of dihydrotestosterone, since the active substance is Methenolone was involved in the Enanthate ester, the duration of Primoxyl 100 to the athlete is about 2-weeks. Comparing Primoxyl 100 with other drugs it can be concluded that Primoxyl 100 is most similar to Boldaxyl, rather than Nandroxyl and Masteroxyl. Nandroxyl is more powerful drug than Primoxyl 100 and Masteroxyl more androgenic, thus it has a different effect on the athlete. By taking Primoxyl 100, athlete is gaining muscle mass of high quality, which is retained after canceling the drug. Muscle mass of high quality, athlete is gaining it if he has a well prepared nutrition and it will be visible if the athlete prior to it’s use was not swollen with fat. You should be aware that if you have 30% of body fat, then gained 3-4 kg of muscle mass, you still will not see it behind a layer of fat. 1. The first cycle of steroids. Many users for the first cycle will feel more comfortable to use oral form of steroids such as Turanaxyl, Stanoxyl, Oxandroxyl and so on, rather than injection as Primoxyl 100. Those who decide to spend the first year only on the injectable form, Primoxyl 100 is a good choice. For an athlete who not used before steroids, Primoxyl 100 will work fine in a dosage of about 400 mg every 7 days. With a balanced diet, exercise and rest, you will see a good improvement from the natural way, while at the end of the cycle, all gained muscles fully are preserved and the cycle will not bring you any health problems. 2. For athletes, whom do not need a huge muscle mass, like in bodybuilding. Athletes, hockey players, fans of martial arts and so on, Primoxyl 100 will give them some quality muscle mass, add power rates, more productivity and more training, because of all this they will mark a progress in their favorite sport and will not to stand with the same indicators from year to year. Of course, for these purposes, Primoxyl 100 has its cheaper rivals as Stanoxyl, Turanaxyl, but these drugs are more dangerous to health. They can also be alternated or combined with each other. 3. Women. Primoxyl 100 and Oxandroxyl are best steroids for athletes girls. Since they affect them perfectly and do not increase the amount of androgens in the female body to an extreme level. 4. Preparation for performances in bodybuilding. Primoxyl 100 practically do not aromatize and therefore the use in the preparation for a competition in bodybuilding is quite justified. Of course, those who advocate it are not using at this stage Primoxyl 100 solo. Solo Primoxyl 100 will not be able to maintain muscle mass from a serious diet and drugs for fat loss. With Primoxyl 100 are used the following androgens: Trenboxyl, Masteroxyl, Testoxyl Propionate. Experienced bodybuilders like to use Primoxyl 100 between powerful androgenic cycles for the rest of the body from heavy steroids. Primoxyl 100, which helps at to some extent to maintain muscle mass during this period. Of course testosterone production is not fully restored. Primoxyl 100 dosage is 200-400 mg per week for beginners in the use of hormones and 400-800 for experienced athletes. Primoxyl 100 is one of the most innocuous steroids, it is weakly androgenic, not flavored or 17-alpha-alkylated steroid. Accordingly, it is perfect for beginners in the use of steroids, athletes and girls who panic and are worried about their health. Primoxyl 100 not strongly reduces testosterone production by athlete’s body. Side effects when using Primoxyl 100 are pretty rare and can occur only in very sensitive athletes: acne, increased growth of body hair, deep voice. Blood pressure and cholesterol levels using Primoxyl 100 remains within normal limits.